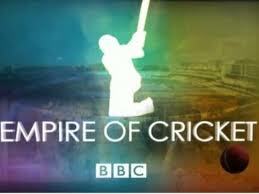 The 2009 BBC production Empire of Cricket is highly (and I, Evander, mean highly) recommended to all baseball fans in the throes of this fallow, no-baseball, hot-stove league/Winter Meetings period. The series is comprised of one-hour episodes devoted to the UK and Australia, India, and the West Indies respectively. I have watched UK/Australia and India. Each may be watched in six segments on YouTube. The two series viewed thus far have several themes in common, and parallel the history of baseball in ways that remain ever-marvelous to me. We fast forward to simpatico Jack Hobbs, who scored 199 centuries, and is definitely a Player (in every sense). There is also D. R. Jardine, who devises the brilliant but still-questionable Bodyline bowling. The Golden Age of postwar cricket sees merit as the determining factor of excellence rather than birth-rank. The old division, by status, was abolished fifty years ago, in 1962. Cricket in India has another history altogether: one informed by a giant inferiority complex overcome; a climate that favors a different way to play the Noble Game; the wily spin bowler; and a bringing together, as well as a separation of peoples along inevitable socio-religious fault lines. It is fascinating (for me) to hear Mohandas Gandhi on the abolition of cricket, as a vulgar remnant of colonialism. It is equally fascinating, in a kind of dialectic response, to hear and see some of the immortals interviewed: Farokh Engineer; fast bowler and all-rounder Kapil Dev (who, like Willie Mays in 1954, made “The Catch” at Lord’s, but with even more on the line); Sachin Tendulkar. The enterprising Indians are making their mark, in large part thanks to satellite television, via T20 and the IPL. These as well as the one-day game are so close in spirit to baseball as to chill the spine, even sitting around the old hot stove. In short, I was mesmerized. This entry was posted in Australia, Baseball, Cricket, England, India, Pakistan and tagged Bodyline, Douglas R. Jardine, Farokh Engineer, Jack Hobbs, Kapil Dev, Pajama Cricket, Sachin Tendulkar, T20, W. G. Grace, Willie Mays. Bookmark the permalink.